A sweet surprise awaits you in every box of this beautifully wrapped gift tower. 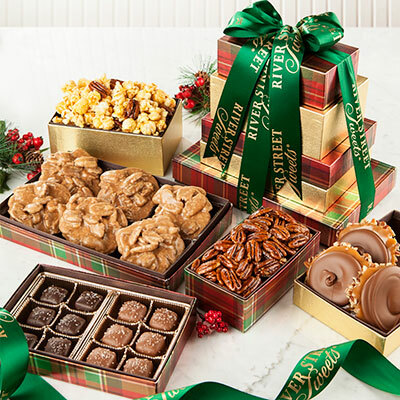 You'll start with our classics, World Famous Pralines®, Milk Chocolate Loggerheads® and crunchy Glazed Pecans. Then delight in our Nutty Caramel Popcorn, and last but certainly NOT least, our staff favorite, Milk and Dark chocolate sea-salt caramels that are melt in your mouth amazing! Box style may vary. Shop our gift suggestions for special address types and warm weather situations. OUR WARM WEATHER GUARANTEE : Special shipping and handling is required for all temperature sensitive shipments from early May through the end of September. This is an additional $6 per address to allow for shipping in coolers with dry ice. During this time, we only ship Monday - Thursday to avoid weekend transit. Please call 1-844-868-6577 or view our Warm Weather Shipping Policy for more information. Bakery items : When the temperatures in our area exceed a certain threshold, our handmade bakery items may require an express upgrade for an additional charge. During the rest of the year, these items ship with our Bakery Express upgrade as needed for the destination and may arrive separately from the rest of your order. Some of our items may arrive with dry ice in the cooler. Please follow the unpacking instructions provided with these deliveries for proper handling. We do not allow bakery items to be in transit over a weekend so please select a ship date of Monday - Wednesday or we may need to delay your order to the following Monday. Thursday ship dates will require Next Day Air year round. Bakery items cannot ship to PO boxes, Military addresses, Alaska, or Hawaii. MILITARY, PO BOXES, ALASKA, & HAWAII : Some of our items cannot ship to military, PO Boxes, Alaska, or Hawaii addresses due to their perish-ability. These include Bakery items and Apples. We would be happy to assist in choosing the right gift for your destination so that it arrives in perfect condition. Call our Gift Specialist at 1-844-868-6577 for a one-on-one consultation or shop our sweet gift suggestions for special address types and warm weather situations. GROUND SHIPPING TRANSIT MAP : Ground shipping transit time does not include weekends or holidays and are estimates. Holidays, inclement weather, natural disasters, and other unforeseen delays rarely occur but can affect your delivery date. All packages ship from Savannah, Georgia. For over 40 years, the Strickland family of Savannah, Georgia has made the South synonymous with handmade Southern Sweets. From World Famous Pralines®, saltwater taffy, hand stretched peanut brittle to homemade pecan pies, our made-from-scratch southern delicacies are known worldwide. The River Street Sweets•Savannah’s Candy Kitchen candy store franchise business opportunities program gives you a unique opportunity to be a part of one of America’s finest and most renowned candy brands, a Southern tradition from the heart of Savannah. It is not only an opportunity to own a compelling candy kitchen franchise business in a truly sweet industry sector, but a chance to share in a lifestyle that is both fun and family oriented. Find out more about our business opportunities program and how you can operate your own River Street Sweets•Savannah’s Candy Kitchen candy store franchise business. Contact us at 844-842-9037 or info@riverstreetcandyfranchise.com. © 2015 River Street • Candy Kitchen, LLC. All Rights Reserved.